Location-based service platform | Geospatial × ICT | Our Business | Kokusai Kogyo Co., Ltd.
A location-based service (LBS) platform provides infrastructure for seamless positioning both indoors and out, and for various types of visualization that can be used by anyone. This enables provision of a range of content – from tourist and shopping information to local event and disaster prevention information – in real time and linked to the user’s actual location. Seamless navigation indoors and outdoors using multiple technologies including GPS, Wi-Fi and pedestrian dead reckoning (PDR). Can transmit information according to the purpose or target using map and augmented reality (AR) technology, push notification and voice guidance. Can be used on all kinds of devices from smart phones and tablets to wearable devices. “ARrow Map”, a map/AR navigation app that can be used on various devices, was introduced at Epson’s new product launch in January 2014. Developed an app for trialing a logistics solution using head-mounted device and an AR navigation system (September 2013). 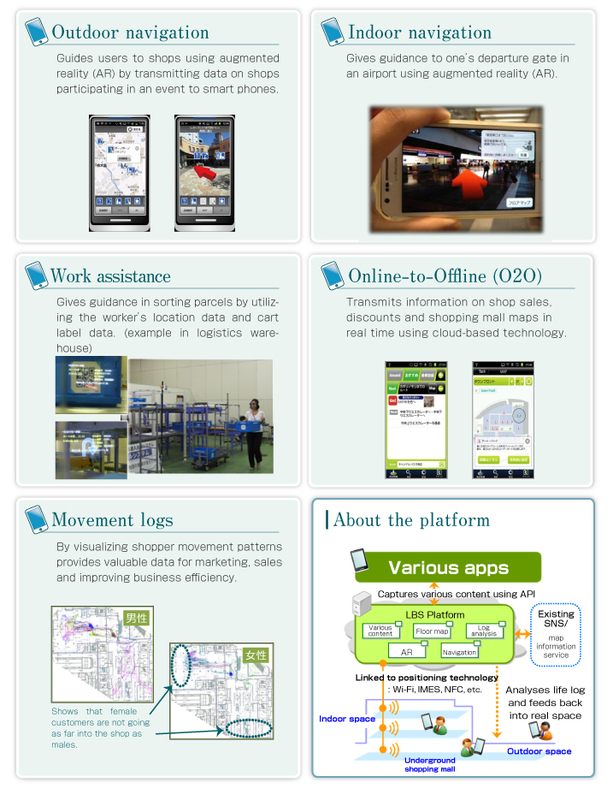 Exhibited proprietary indoor navigation app at Epson Business Integration Forum, July 2013. Developed a trial app for promoting various nightlife events in Kanazawa, Ishikawa Prefecture and Tokyo in March, May and October 2013. Participated in a project to showcase how location data can make outings more enjoyable, the Location Cruise Project, which is part of the Ministry of Economy, Trade and Industry’s G-spatial project (February 2012). Provided technology license for “JAL AiRport Navigation” for navigating in Tokyo’s Haneda Airport, from 2011.